The greater and lesser spotted eagles look similar. Their wing span is 130-180 cm. The plumage of adult birds is entirely brown, while young birds are covered with light spots to a lesser or greater degree. Externally, spotted eagles resemble the common buzzard and from afar it is only possible to differentiate between the species by their silhouette when they fly: while the spotted eagle usually keeps the tips of its wings down when it glides, the common buzzard generally holds them up. When inspecting the birds from closer quarters, it can be noticed that the common buzzard usually has a lot of white in its plumage, while the spotted eagles are usually uniformly brown and have only a few white spots in their feathers. Upon even closer inspection, the observer will find that the feet of the spotted eagle are covered in feathers down to its toes, while the legs of the common buzzard are devoid of feathers. Telling the difference between the two species of spotted eagles is difficult. As a rule, the greater spotted eagle is darker, slightly larger and sturdier than the lesser spotted eagle. Differentiating between the two is also difficult because the lesser and the greater spotted eagle form mixed pairs and produce hybrids. Spotted eagles usually hunt their prey on grasslands that are not intensively managed, but also on wetlands, fields and other open landscapes and infrequently even in forests. Their hunting grounds are usually located near their nests, located up to 1-2 km from the nesting site. The spotted eagle usually hunts its prey in flight or by stalking from trees located near the edges of forests and other higher places (lone trees, balls of hay, electric posts), and occasionally, the eagle looks for its prey walking on the ground. The eagle actively hunts its prey by flying or walking in case of poor food resources, but in case of rich resources opts for stalking prey. The prey consists mostly of small mammals – voles, moles, with frogs and birds often included in the menu. Sometimes the spotted eagle also hunts for snakes and larger insects. Spotted eagles are migratory birds that winter in the Middle East, Southern Europe, Central and Southern Africa. The migration to Africa and back takes place mainly via the Bosporus Strait, the Middle East and the Nile Valley. The greater spotted eagle arrives in Estonia at the end of March and the first lesser spotted eagles can be spotted somewhat later—at the beginning of April. Both species leave in September, but individual birds can still be sighted in October. The spotted eagles live on a mosaic landscape, where forests alternate with meadows, pastures, fields, river valleys and swamps. Lesser spotted eagles are more adapted to life on agricultural terrains than are their larger relatives. Spotted eagles usually construct their nests themselves and inhabit them repeatedly on subsequent years, especially if not disturbed. Occasionally they use the old nests of other larger birds of prey (the common buzzard, the northern goshawk) or of the black stork. Sometimes a pair of spotted eagles has several nests which are used alternatively during different years. The eagles start building or repairing the nest immediately upon their arrival. By the end of April or beginning of May there are one or two (very rarely three) eggs in a full clutch. The hen begins brooding right after laying the first egg, due to which the chicks hatch at different times. The hatching process lasts for 37-41 days. The fledglings are able to fly at the age of 8-9 weeks, which in Estonia usually coincides with the first half of August. Of the fledglings one, or very rarely two, learn to fly. The procreational success of Estonia’s spotted eagles is characterised by a 3-year cycle which results from the change in the numbers of voles, the eagles’ prey of choice. During top years, the productivity can reach an average of over 0.8 young birds raised per pair, but during the lows of the cycles, the number can drop to below 0.3. The lesser spotted eagle is the most numerous species of eagles in both Europe and Estonia. A hundred years ago, the species was not as common as today, and their numbers further decreased during the first half of the 20th century as a result of the “hawk war”. Afterwards, the population has gradually recovered. During the 1960s and 1970s, there also occurred a change in the ecological niche: the eagles began nesting near cultivated landscape. After that, during the 1980s, the number of lesser spotted eagles probably grew rapidly. In Estonia, the number of lesser spotted eagles is currently estimated at 480-600 pairs (up to 20,000 pairs in the world). The largest areas of habitation of the lesser spotted eagle are currently located in Belarus (3,150-3,350 pairs), Latvia (2.000-2,800 pairs), and Poland (1,660-1,850 pairs). There is no significant information regarding the numbers of greater spotted eagles in Estonia from earlier years—definite proof of their nesting dates from 1995. 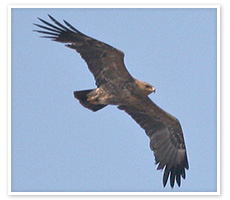 According to present estimates, 20-30 pairs of greater spotted eagles live in Estonia.